Many facilities within NSW lack the tools to capture the necessary data to track and analyse surgical complications. Without the ability to analyse these data, it is very difficult to fix any problem areas. The American College of Surgeons National Surgical Quality Improvement Program (NSQIP) data enhances a hospital’s ability to zero in on preventable complications, using validated, risk-adjusted clinical and administrative data. Capturing these data points and applying benchmarked performance results to drive quality improvement initiatives are an integral part of the Agency for Clinical Innovation’s (ACI) strategy of embedding quality improvement practices to ensure safer patient care and achieve improved health outcomes. NSQIP assesses a hospital’s surgical outcomes against local and international peers in one of the largest international outcome databases ever created. These results enable targeted quality improvement initiatives to be developed to enhance the quality of surgical care while reducing complications and costs. 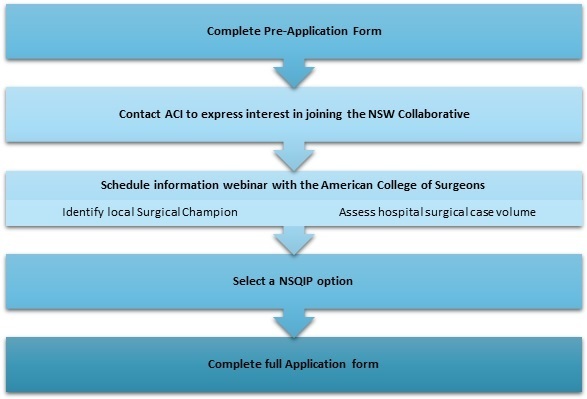 ACI and the NSW Ministry of Health are supporting NSW hospitals to implement and embed the program as part of broader surgical quality improvement efforts which will support the delivery of better surgical services, and improved health outcomes for patients, families and carers in NSW. How can my hospital get involved? NSQIP participants come from a wide range of subject matter expertise, but are always passionate about surgical quality improvement. A Collaborative is a group of two or more NSQIP participants working together to exchange ideas, solve problems and share knowledge. Face to face meetings are supplemented with the online communication platform BaseCamp, where Surgical Clinical reviewers discuss data collection and coding, and ask advice or questions of their peers. 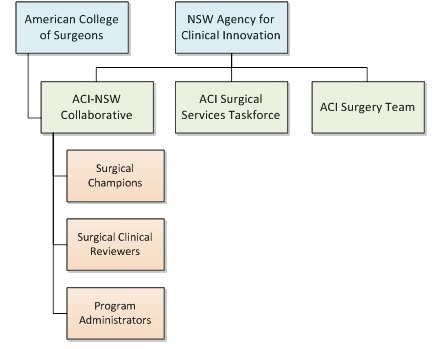 A number of capability development, change management and project management tools and resources are also made available to support the quality improvement efforts of ACI-NSW Collaborative members. A detailed list of contacts for participating hospitals will be released shortly.